Face of disbelief is that he must have been traffic agents of the Civil Guard who met this past Sunday with a squad of up to 37 Polish cyclists on pilgrimage to Santiago via the AP-9. To intercept three patrols were sent, that they located the height of Pontevedra, having accessed the highway from the N-550 which had arrived in Galicia from Portugal days before, with the intention to reach Santiago de Compostela that same day. 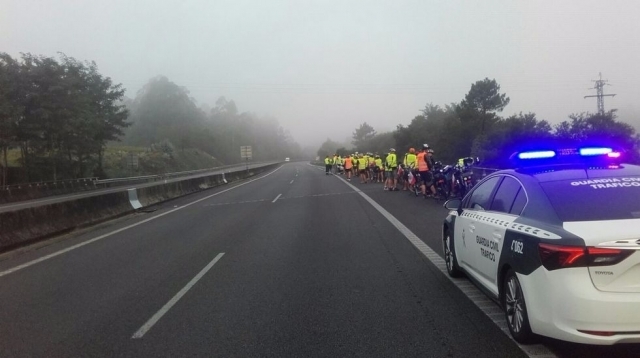 The group of Polish cyclists, who traveled with the support of a rental car, decided to take the AP-9 highway in the city of Pontevedra and had already walked six kilometers when they were found by agents. With the help of the company that manages the highway were asked to change direction to get out of it as soon as possible, as the group of cyclists was a serious traffic danger in this type of track. The group was escorted back to the national road to continue their pilgrimage to Santiago. On the other hand, responsible for the organization of the pilgrimage has been fined by the agents for a very serious infringement having to pay 500 euros because bicycle traffic on highways is prohibited in the highway code (must be limited the field of general road). Están locos... menos mal que no le ha pasado nada a nadie. Me parecen hasta poco 500 euros de multa. Esto quiere decir q en si país se puede usar la bicicleta por las autopistas? Con lo peligrosas que son las autopistas españolas, que hay cada uno suelto al que le vendrían bien un buen par de collejas. Menos mal que no ha ocurrido nada a mayores.